The Russian presidency is preparing for the visit of His Excellency President Vladimir Putin to the Kingdom of Saudi Arabia, and coordination is underway between the two parties through diplomatic channels to fix a date for the visit. The Custodian of the Two Holy Mosques, King Salman bin Abdulaziz Al-Saud, paid an official visit to Russia in October last year, when the two leaders held bilateral talks in which the Saudi Monarch invited the Russian President to visit the Kingdom. Relations between the two countries have developed significantly during the last two years following an official visit to Moscow in May last year by Crown Prince Mohammad bin Salman, Deputy Prime Minister and Minister of Defense, at the invitation of the Russian President, and upon the directives of King Salman. During that visit, talks were held on a myriad of shared files between the two. Dr. Nurhan Al-Sheikh, Professor at the Faculty of Economics and Political Science at Cairo University, said that the recent visit by Foreign Minister Adel Al-Jubeir to Russia and his meeting with his Russian Counterpart Sergei Lavrov reflected the real understandings between Russia and the Kingdom in various fields. In a special interview with "Riyadh", Dr. Nurhan Al-Sheikh stressed that the relationship between the two countries is broader than oil, pointing out that Russia and the Kingdom together determine oil prices, and the balance between them affects the stability of the market, which serves the economies of both countries. She stressed that the timing of the visit is very important for many reasons; discussing the Middle Eastern issues in general, especially Syria and Yemen. She pointed out that Russia and the Kingdom share the need, and certainly Russia needs the Kingdom to rearrange the cards in Syria as the Kingdom is an important regional player in the Syrian file, and it is certainly important to formulate understandings about the future in Syria. Al-Sheikh said that the most important joint files that are expected to be discussed is the main file between the two countries on the oil prices. The United States has joined as an exporter of oil and gas and it is important to have understandings between the two countries on prices and production volume because that is national security of the two countries which mainly depend on oil exports as a resource to public treasury and revenues, which is therefore very important for both countries. In addition, military cooperation and deals such as the S-400, and in general the bilateral, regional and international contexts, make the summit extremely important for both countries. Dr. Nurhan Al-Sheikh added that Moscow has a vision to manage its foreign relations that it does not establish narrow alliances. It operates in a system of parallels. For Moscow, there is no axis better than another, and the idea lies in the convergence or divergence of interests and to what extent the other side responds. Al-Sheikh stressed that Russia and the Kingdom together determine the price of oil, and the balance between them affects the stability of the market, and this serves the interest of the economies of the two countries to keep the oil prices stable. 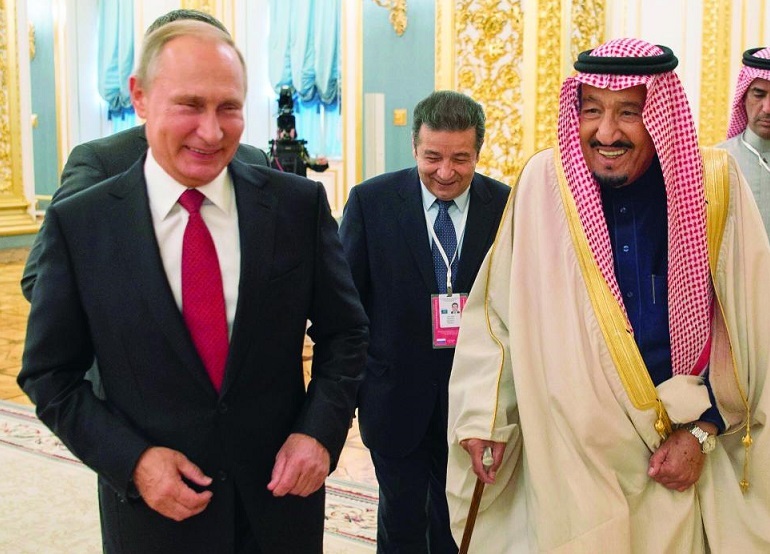 Certainly, the Saudi-Russian cooperation is broader than oil. It is true that oil is a major axis and may be a backbone of these relations, but there is, for example, cooperation in space. Al-Sheikh deemed that the Saudi-Russian rapprochement will contribute to resolving matters in Syria because the Kingdom is an important regional player and the crisis in Syria has many overlapping parties, and thus the Russian-Saudi understandings will be very important to resolve the Syrian file.